At the core of my home business ideas for people who want to start a home business is the ability to make money online. This is because Online business is easier to run and requires low overhead costs. When people want to make money from home, they are typically constrained by a lot of things especially if they have other responsibilities which make them homebound. For example, if you are a caregiver to a sick person or stay at home mom or Dad. Your main responsibility requires you operate within the confines of your home, therefore you cannot afford to start a brick and mortar business that will require you to leave the home area to go rent an office. This is why making money online provides you with the best option to create what you desire as a person. Today’s article is about 5 top posts that teach how to make money online. Etsy gives you the opportunity to sell your handmade goods online. This means that you can be at home producing your handcrafted items and then have the opportunity to sell to people who love the kind of products that you make. Etsy is a company that has been around since. I wrote a post how to start an Etsy shop, in that post I went in-depth on the various steps you need to follow in other to start an Etsy shop. With the guidelines provided within this post, you should be able to start the online business of selling on Etsy especially if you already have products you make at home that you require to make money from. Printables Business: In this day of online business, selling your printables online is the fasted business you can start with your design skills. If you have a little design skill and a knack for bringing together good designs, you should be able to make and sell your printables from your laptop anywhere you are. I wrote an excellent piece on how you can start a printables business within 2 hours. With the advent of the internet, the world has become an online classroom, meaning that anyone who has a life experience worth sharing can create a course and teach anyone who desires to learn. This is the reason why online learning platforms like Udemy, Coursera e.t.c are flourishing. Here is a post that will break down the cost of creating a course. The good thing about the course creation is that once it’s done and uploaded on a platform where it can be accessed, your major work is done. The only thing required is the promotion to get sales. 4: Selling other peoples Products to Make Money online. Selling other people’s products has become much easier especially with products that you have researched and seen that it’s a good fit for the audience you are targeting. When you have physical products which you want to sell but you don’t want to stock it. You also don’t also have much money for overhead costs neither do you want to deal with packaging and shipping. Then you have to consider Dropshipping Business. Drop shopping allows you to promote other people’s products to your target market, make sales from it and then inform the manufacturers to ship it to your buyers. The good thing about drop shipping is that you make a sale first before you even spend money to buy the goods the person ordered. You don’t have to go through the hassles of stocking products or shipping product. From the comfort of your home, you can sell thousands of products to buyers without ever touching the product just your money. Hahaha. If you love that idea of business then you have to read this post how to start a Drop shipping business. In that post, I went in-depth on all you need to start up. It includes where you can source your product from, the manufacturers and sites that give you the best list of wholesalers to how you can set up an eCommerce platform that suits your needs. 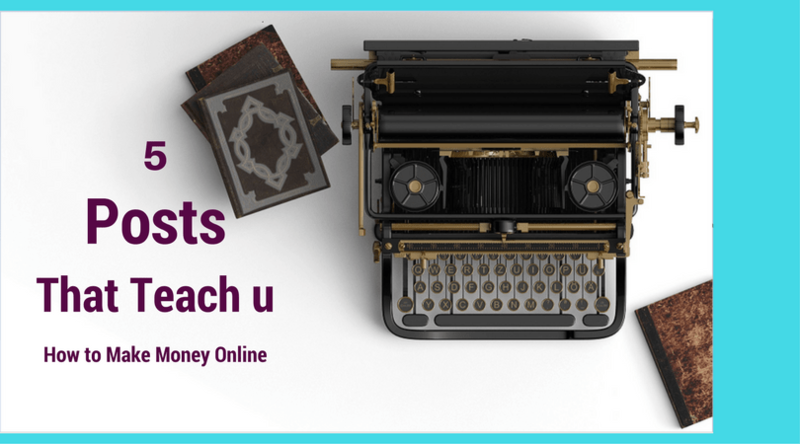 5: Writing to Make Money Online. If you have a knack for writing great articles or you love to tell a good story, then the online business that will suit you will be Blogging. Blogging has given lots of people the opportunity to tell their own individual stories and make a living by sharing it with their followers. By creating followership, they have been able to monetize their content and get themselves a tidy income all from the comfort of their home. The beautiful thing about blogging is that you can blog about anything and you will find your own tribe of followers that will like your content. I did a post on how blogging will help you make an income. Read it here. If blogging is what excites you then you have to ensure you know about Plugins, the very great helper of the Newbie Blogger. Read my post on 7 must have Plugins for a newbie blogger. If you have looked at all these choices and you can’t seem to find something that suits you, then head over to my post on how to pay yourself as a stay at home mom for more ideas and options. I can’t end this post without telling you that working from home is not always so cool. Therefore here are 7 things to expect when you work from home. A little dose of inspiration to close for today, read my post on God will outlast your storm.